For every member of Wei that is alive, Da Xiao Qiao's hand limit is increased by two. When a member of Wei dies, the bonus of "Bronze Bird" is depleted. 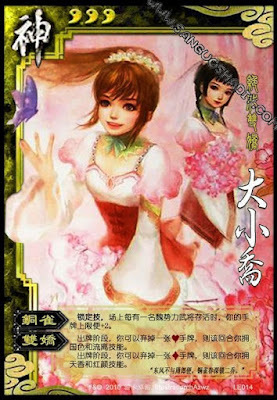 "Country Scene" and "Displace" are the powers of Da Qiao, where "Fantasy" and "Beauty" are the abilities of Xiao Qiao. It is possible for Da Xiao Qiao to use powers from both sisters during the same round. They must each be acquired however.